With just three weeks to go to until the 50 Miles More Massachusetts march from Worcester to Springfield, we are posting another blog written by the student organizers. The march will be held August 22nd through August 26th, with a rally outside of Smith and Wesson at the end. The entry below was written by Chinaly, a 17 year-old student leader at Sabis International Charter School. “The past six months have been substantial in molding me into who I am today. In February of 2018, I opened Twitter and saw the impact of loose gun laws and disregarded red flags. I saw hundreds of students my age fearing for their lives, and bullets ripping through some of their chests as they huddled in classro oms trying to go undetected on the shooter’s radar. It rattled me to my core that this was the gruesome reality I had to live in, kids dying in a place they were supposed to grow. I have never felt that kind of fear in me my whole life and even now as I rethink about the experience my heart starts racing and my eyes start watering because I was scared and I still am scared. 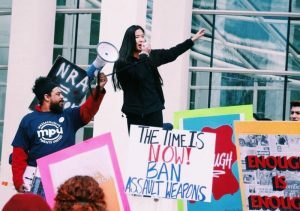 I am still scared because there is still so much more to be done to ensure that mass shooting like Parkland don’t happen again, and that’s why I march. I march for better legislation. I march so no other child has to experience the same fear I did. I march so no parent has to receive a text saying “if I die today at school, know that I love you”.